I didn't see any threads for Tony so here is one. I think he is a really talented actor and singer and hope to see more from him. -Won a singing competition at the age of 17 and released 3 Taiyu (Hokkien) solo albums. Hosted Super King (2010). Hosted many variety shows such as: Young Guns (Shao Nian Te Gong Dui), Best Friends/Fight Club (Dou Zhen Ju Le Bu), Complete Entertainment (Wan Quan Yu Le), Lucky Strike etc. Tony's new series, Full Count- which also stars Qiao Qiao, Chen Yi and Xiao Qiao starts airing this sunday. Has anyone watched Mo Jian Shen Si Qi? I think he is doing a great job in there. Thank you so much for starting a thread on Xie Zhi!! Too bad not many of his fans come here... I hope that more of them will come here too... I hope that he can be in more ancient series. I really love his performance in Mo Jian Sheng Si Qi even though he is evil. In that second picture of Tony, he sorta looks like Kenneth Chan Kai Tai. I think I read in the Mo Jian Shen Si Qi that people didn't like him for some reason. Well, I haven't seen or heard of him before what is posted at the forums here. Trinie: Thanks for your comments. Yeah, I really hope he stars in more ancient dramas too- he really looks good in ancient costume. Suet Seung: He does look slightly like Chan Kai Tai at times. Yeah, a couple of people in the Mo Jian Shen Si Qi thread don't like him because they don't like 5566.Personally I like 5566 and think that they are one of the better boybands. I'll see if I can come up with a design sometime and post it here for suggestions. You know. . .asianfanatics thread doesn't move too fast either. . .it's cuz xiezhi's news don't get translated into english too often. . .people think he's doing absolutely nothing nowadays when he is in fact doing quite a bit! Last edited by Cinnamon; 10-12-07 at 05:06 PM. Some of us needs to learn how to get our priorities straight and others need to start getting some priorities. . . Thanks again for starting a thread on Xie Zhi. A lot of fans and members here either don't know him or just don't like him and the rest of 5566. Or it may be because he isn't in that many series. He has only been in one ancient series too. Hm... I suddenly forgot who Kenneth Chan Kai Tai is so I don't remember if he looks like Xie Zhi or not. Let me look through my calenders and all to refresh my memory. Last edited by Trinie; 10-12-07 at 10:40 PM. You're welcome again! 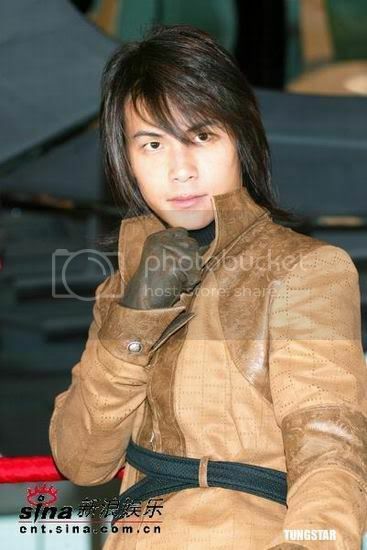 He doesn't look that much like Chan Kai Tai, just very slightly and at certain angles. Plus Xiezhi is better looking, although shorter. Last edited by Trinie; 10-14-07 at 02:06 AM. You're welcome, Trinie! I agree that XieZhi does look strict/serious when he is not smiling, but he does have the nicest smile. Actually I think he looks silly when he is smiling. XieZhi does look quite a bit like his mom, but I'm not sure who is Wang Jie. I bought his first book too and I had my mom translate for me (she really likes Xiezhi too). His book is really interesting and inspiring. His first book is really interesting. I have his second one too...I agree that he looks quite a bit like his mom. His childhood pix were so cute. It was too bad that he didn't include many of them since he said that he really hates to take pictures. But his mom forced him to take pictures at each stage of growth for memories. His books are both great and are really touching as well as inspiring. I plan to get his first book for my friend to introduce her to Xie Zhi. Yea, his book is great and inspiring that I can't wait until I have to time translate some parts of it for others to read...I wish that more fans of Xie Zhi would come here too. Last edited by Trinie; 10-15-07 at 02:54 AM. You're welcome Trinie! Yeah- I really like that clip too- Xiezhi is so cute when they attack him and muss up his hair. He is so adorable when he says they will get into trouble because his suit is ruined. I wish I had his second book. I haven't been able to find it since Yesasia doesn't sell it anymore. I was ripped off on his second book since I wanted it so much... I can tell you how to get it, but it is just expensive that's all... If you really want it, then you can PM me and I will let you know ok? I watched the rest of the episode. . .and xiezhi looks really tired near the end. I wonder how late they were filming. . .
Last edited by Cinnamon; 10-16-07 at 03:50 AM. Oh they really do?? I didn't know that since I have not seen that on any shows that I have seen of theirs at all...I often see them falling and leaning on each other though... 183 does that as well. I love the bond they have with each other. Last edited by Trinie; 10-18-07 at 03:40 PM. Xie Zhi won 1st place for the singing competition. He had to compete for more than forty weeks and each week he had sing 2 songs, one in Mandarin and one in Taiwanese. Both his mother and grandparents were there to support him in the final. Thanks Cinnamon and Trinie for the clips. So cute and funny! Yeah I think I remember that Xiezhi won 1st place in the singing contest. I like his voice when he's singing Taiwanese songs too (even though I don't understand)- it's a little different than when he is singing in Mandarin. lol. Thanx Trinie for the clips. . .yeah, it looked like he won 1st place. . .cuz usually, you don't really get that much attention for 3rd place. . .considering both his mum and grandma went on stage and cried. You know. . .I had the strangest dream about xiezhi's mum the other day. . .I woke up and was so freaked out how vivid I can visualize a woman I've never met. . .and then later remembered that I watched the clip you posted the day before. I felt so silly. . .apparently I have seen her before from the clip.